Karamel Cafe, the chocolate chip cookies cafe, has opened in Islamabad! Karamel Cookies: Is it worth the calories? Karamel Cafe, a Karachi based cookie company, recently opened its doors in Islamabad at the newly upmarket Beverly Centre, F-F/1. I decided to visit before you can say K is for Karamel! What was the inspiration behind Karamel (perhaps Ben’s Cookies or Mrs. Fields)? Sheena: My love of cookies over any other dessert! Interestingly, Sheena doesn’t indulge in tasting the batter herself, but gets her family and close friends to give feedback. She disclosed to me that she doesn’t share her recipes with anyone, and workers are only handed the prepared batter to mix. This becomes interesting logistically, as she has to send the batter from Karachi to Islamabad in a fresh state. 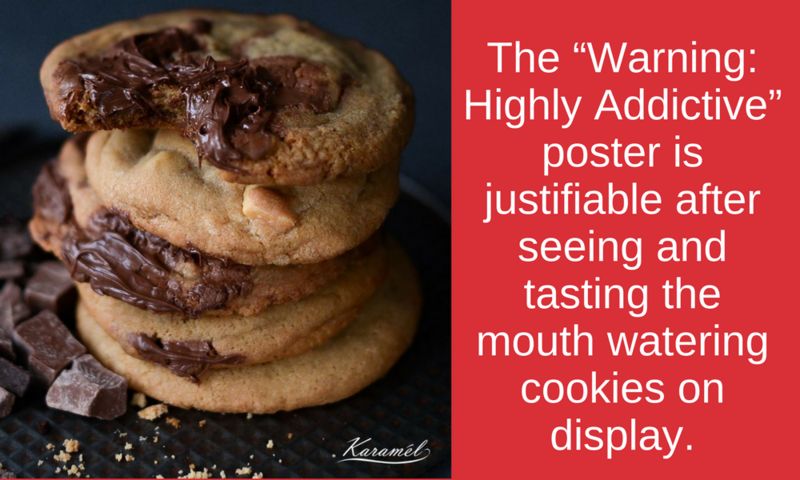 Slogans such as, “For the Love of Cookies” and a poster stating “Warning: Highly Addictive”, gives the place a welcoming ambiance. The cafe emits a diner-like feel. There are high chairs with a table to the side, and more comfy sofas on the other side of the space. Although Karamel Cafe is housed in a compact setup, the interior gives it a fresh feel. As one enters, the full range of cookies on offer are on display. They come in twelve flavors currently. Prices range from Rs.150 to 220. The most popular flavour is the milk chocolate (Rs.150). Sheena mentions that the ‘Oatmeal Dark Chocolate’ (Rs.200) doesn’t get the recognition it so richly deserves. Karamel’s central location at Beverly Centre is already generating the publicity they want. On the opening day- 28thApril, 2018, the first hundred customers were presented with free cookies! They don’t do deliveries just yet, but they plan to, closer to Ramazan. I tried the milk chocolate chip cookie which had a chewy texture and tasted very fresh. Cookies are baked fresh daily. The cookies can be likened to ever-popular brands such as “Ben’s Cookies” and “Mrs. Fields”. They taste just as good! They make a perfect afternoon snack. A home delivery service would be a plus point for tea parties and birthdays. So far, the café serves instant coffee and there are no savories on the menu. Karamel Cafe can definitely go a notch higher and serve brewed coffee, given that Islamabad customers have become more discerning over time. And most of the cafes do serve brewed. It would be a pity to miss out on customers due to a lagging drawback in the coffee department. However, once you bite into that chewy goodness, you might just forget all! 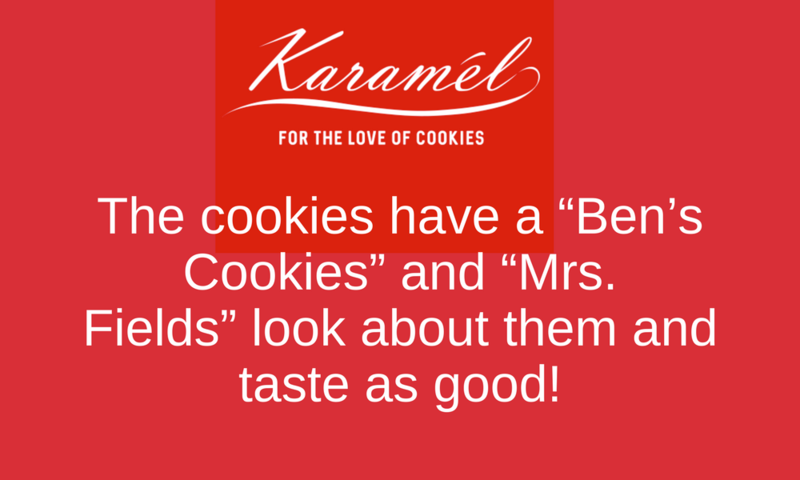 Thanks to Karamel, life is now full of cookies! Oh, and is it worth the calories? Definitely! My taste buds have spoken without a hint of doubt! Karamel Cafe is here to stay! or better still, get our very popular Chocolate Tart Recipe or if you prefer going whiter and grander, then try our White Chocolate Raspberry Cake and have a real Kitchen Adventure! Maha holds a Masters Degree in International Security from Georgetown University USA as well as a Teaching Certificate in Elementary Education from New Jersey. She is currently working in the field of education. She dreams of opening a school of her own one day. Maha loves to write, read, travel, and do sports and yoga. She believes in becoming the best version of herself. She has travelled widely, and has engaged in voluntary and non-voluntary work on multiple occasions: Developments in Literacy in Washington D.C and SOS, Islamabad Pakistan, to name a few. Maha loves watching a good Bollywood film occasionally and lives by the motto: Count each day as a blessing and practice more gratitude.